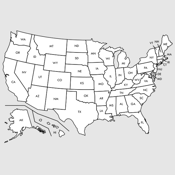 Learn the Capitals of the 50 U.S. States plus 5 U.S. Possessions. Engaging graphics and sounds, timed, tracked, randomized quizzes. Suitable for all ages.